I think it was Katherine Whitehorn who said "life's too short to stuff a mushroom", and I've often been reminded of it when first encountering something new and potentially interesting, but which I realise will require a great deal of study to properly appreciate. So it was when I first heard Fado. I thought "This sounds interesting, but with English, Irish and Italian music on my plate, do I really have the spare time to devote to something else as well?" The answer was a clear "No" and I reluctantly passed it by. Now, here's an opportunity to get a quick and painless background in the music by way of this book and accompanying 24-track CD. Does it do the job? Am I primed to become an enthusiast? Sadly, the answer is "not really" to both questions. The book starts with 13 pages of Portuguese Chronology, beginning in 2000 BC, and this might be seen as good historical practice, setting the scene for a description of the development of the genre. But when we move on to the text we find that the earliest mention of the term Fadista is in 1849 - so the first 7 pages of the Chronology might be seen as superfluous, particularly since this early period of Portuguese history is rarely mentioned in rest of the book. We then get a brief Introduction, Beginnings and Instruments sections, each of which contain a good deal of interesting information. Unfortunately, it's not organised chronologically, or to develop some central thesis, and so is rather confusing to follow. We then move on to the three main sections of the book, dealing with the three cities where the Fado has developed - Lisbon, Coimbra and Porto - and these are by far the most interesting parts. Next is a long section on The Media Industry, followed by The Diaspora - touching on the Fado in the USA and Brazil. Lastly there is an information section - Glossary, Discography, Index and a useful list of currently active Fado houses in Portugal. It is inevitable, but unfortunate, that the Media section (Paul Vernon's great and abiding interest - record companies, radio stations, etc.) 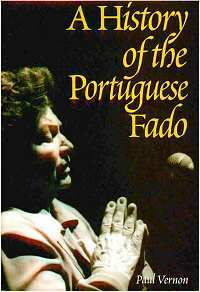 should comprise exactly one third of the total text and yet contain almost nothing about the Fado. I am supposed to be being given a history of this music - do I care about the machinations of various record companies and their distributors; do I need to know the exact terms of the 1925 distribution contract between Columbia and Valentim de Carvalho (this takes 3 pages of text)? Where is the music, fer cri'sake? In fact, to be truthful, I know very little about what the Fado is in musical terms after having completed reading this book. I know a lot of facts about its history (who, what and when), but I am no better able to recognise a fado if I hear one than I was before I started. I know about the differences between Lisbon and Coimbra fados, but have no idea how they sound. Paul Vernon is a competent, but not a good, writer and he fails to make me interested in the music he tells me he is interested in himself. In one short, five page section at the end of the Lisbon chapter, he describes his experiences in 1987 when staying in the capital and visiting various fado houses and meeting the musicians and enthusiasts. Only here does his writing begin to sparkle and, at last, I start to get some idea of the genre and the feelings it generates. For the rest of the book I am mostly bored and confused. I've not encountered anything else published by Ashgate Publishing, but if this example is anything to go by I would advise them to invest in the services of a good Editor. The book is very data-rich, but it's so poorly organised and presented that little of it gets processed into useful information. Moreover, there are a number of annoying slips which an editor (or even a proof-reader) should have spotted and corrected - incorrect use of apostrophes, confusions between there and their, etc. Most annoying is the regular use of the adjective 'Lusophone'. Working from the context, this appears to mean 'pertaining to Portuguese language or culture' - but it is never explained, nor even included in the Glossary. Hoping for enlightenment, I tried all the dictionaries in the house, but none of them, including the Shorter Oxford, are any more familiar with the word than I am. "Have you forgotten the CD?" I hear you cry. Well, no - I haven't - but Paul Vernon seems to have done. Quite extraordinarily, there is not a single reference to it in the entire book - it doesn't even appear in the Discography! Only on the back of the dust-jacket does it get mentioned, with a track listing of which close scrutiny reveals that all the items are from the late '20s / early '30s except one from 1911 and one from 1944. Since the book deals with the period 1850 to the present day, it will be obvious that much of the music under discussion is not to be found represented on the CD. Just what is going on here? Surely a book/CD combination is the ideal medium to discuss music - allowing a reader to listen to an example while the text explains features and characteristics, points up differences and similarities, leads the reader to an understanding of the genre. Here, this golden opportunity has been completely ignored. It seems as if Paul Vernon was unaware of the CD's existence and it has been added by the publishers as an afterthought without any consultation with the author. The CD itself has only the names of the principal performers against the track numbers; the back of the dust jacket gives, in addition, the title of each piece, the accompanists, date and place of recording and the original disc label and number. Essentially, this is a record without sleeve notes. To make sense of it, the reader needs to read through the book and at every mention of a name (and there seem to be thousands) s/he must check the back cover to see if anything by that performer is included on the CD. So what is Fado? What does the music on the CD sound like? Well, what ever it is, it's a long way removed from traditional folk music. It would appear that its origins are obscure and the subject of heated dispute among aficionados, but most agree that it was originally the song of the poor and the dispossessed, passing then into street singing and disreputable café society and thence into reviews, legitimate theatre and on into films, concerts and world tours. Having reached the disreputable café stage by the time it first came to public notice (1849), there was clearly little of the folk music element left by the time these recordings were made. Furthermore, it should be pointed out that all of these recordings were made and issued by large commercial companies (HMV, Columbia, Odeon, Parlophone, Polydor) for strictly commercial reasons, and Vernon admits that, during this period, the market was a wholly middle-class one. Having said that, and having accepted that I still know very little about the Fado after having read the book, I can really only offer a couple of examples from the CD which appeal to me in terms of the way they sound and for the passion evident in the performances. I have no idea of how authentic they are, or how representative of the genre as a whole. The first is Fado da Mouraria by Maria Emelia Ferreira, recorded in 1927 with unknown guitarra (Portuguese guitar) and Viola (Spanish guitar) accompaniment. "She was among the first wave of Fadistas who sang in a more directly emotive style than had previously been heard on disc. A blending of street-level attack with a measure of professional polish ... " And very nice, too. The second is Maria Silva singing Fado Britinho, from 1928. The guitarra accompaniment is probably her own, and the viola player is unknown. She was also among the 'first wave' mentioned above, and I would presume that this approach to the music, which appeals so much to me, did not find favour with the record-buying public, since few of the other tracks exhibit this level of passion. What a pity! Indeed, it would seem that is not passion , but saudade which is seen as an essential ingredient of Fado. This characteristic has been described by Rodney Gallop as a " ... yearning for something so indefinite as to be indefinable; an unrestrained indulgence in yearning. It couples the vague longings of the Celt for the unattainable with a Latin sense of reality which induces realisation that it is unattainable, and with the resultant discouragement and resignation". The Fado seems, to me, sad and depressive without the relief of anger at the cause of the sadness. I've read one great book about music (Bernard Lortat-Jacob's Sardinian Chronicles, ISBN 0-226-49340-5, which also contains a wonderful CD), several good ones (including Georgina Boyes' The Imagined Village, ISBN 0-7190-2914-7), and a number of poor ones. I fear that A History of the Portuguese Fado falls into the latter category. It costs �39.50.